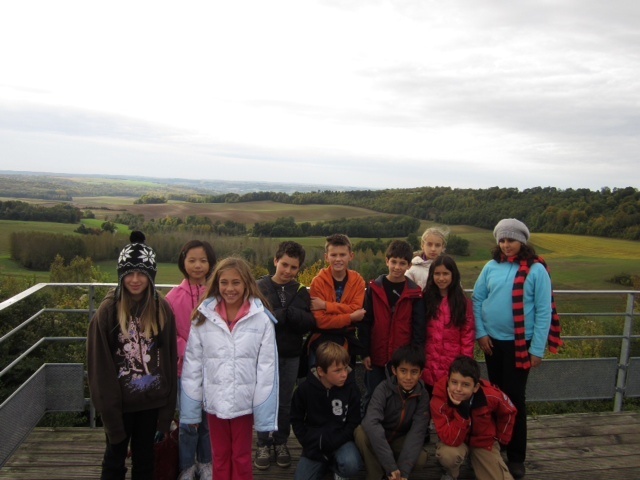 We had a great day today visiting La Caverne du Dragon and Le Chemin des Dames to learn about WWI. We took the bus to La Caverne du Dragon (or Dragon's Lair) in English and were met by our guide, Yves, upon our arrival. First, we watched a 20 minute video about Le Chemin des Dames and WWI in order to get oriented. Our guide then took us to see a WWI cannon as well as a shrapnel bomb from the war. He explained how this war was different because there were now airplanes that could spy for the enemy in order to locate the position of cannons and other things, so it was necessary to camouflage everything in order to hide from passing planes. After we learned about some of the weapons used during WWI and the total destruction done in the region, we began our descent into the Caverne. The children (especially the boys!) were thrilled to see a WWI machine gun when they entered the cave. They were even allowed to touch it! Our guide explained that the Caverne is an ancient limestone quarry used by monks in the 1700's. There are still markings on the ceiling of names and dates left by the monks. During WWI, this quarry was used by the Germans as a sort of barracks. It was named the Caverne du Dragon or Dragon's Lair because of the fire from German machine guns that would come from the entrances. It provided a "safe haven" for soldiers exhausted by the difficult living conditions and the atrocities of war. They were able to be sheltered from the rain and snow, could clean themselves with well water from the well in the Caverne, could eat a decent meal, and even get some rest. However, they still worried about many things while in the Caverne such as cave ins from the bombings above or poison gas that could enter as it was heavier than air and would sink. The Germans built walls within the Caverne du Dragon in order to block off the less safe Southern entrance that faced French lines and to keep the gas blocked off on one side of the wall. The Caverne du Dragon was used as a barracks but also to transport and shelter supplies. There was a secret tunnel in between the northern and southern part of the Caverne that served as a passageway for goods and troops. When the French succeeded in taking the beginning of the German lines in 1917, they also gained control of the Caverne. There was even a period of cohabitation with the Germans living in the northern part and the French occupying the southern part of the quarry. We walked through the entire Caverne and saw more examples of weapons, leftover bottles, barbed wire, the Chapel where officers were buried, and souvenirs made from WWI artifacts, such as leftovers bullets turned into airplanes or bombshells turned into vases. After our visit, we had a picnic lunch, and although rain was predicted, the weather was mild and only partly cloudy, so we were able to eat outside. 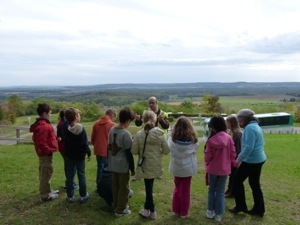 We met Yves afterwards for our guided visit of Le Chemin des Dames. The first thing we saw along the route was a statue to honor Napoleon's soldiers and the soldiers from WWI. It had two dates (1814 & 1914) and two young soldiers. The artist had lost a brother during WWI in the battle around Le Chemin des Dames, and it is said that the soldier represented is supposed to be his brother. As we continued on, we had to imagine the area during WWI as a sort of lunar landscape filled with trenches and bomb craters and no trees or vegetation. This was hard to imagine as now the forest has grown back and the fields are green. We stopped at the "Plateau de Californie" to see the remnants of some German trenches as well as a memorial statue dedicated in 1998 to those lost in the war, both military and civilians. The "Plateau de Californie" got its name from a man from the area who sold his champagne in California. We were able to look from the Plateau down into the valley where French lines would have been. It was evident how difficult the French soldiers' mission of overtaking the plateau really was given the fact that the Germans had an excellent view of their targets below. Our guide took us into the remnants of one of the trenches and explained that up here on the plateau, there were many problems that a soldier could encounter. There was no water source up on the plateau, and with the fighting, dust, and smoke, the soldiers would need a lot of water, so someone would often be sent with 20 canteens to fill them up for his unit. He would have to travel alone back down to the water source and back up, and hopefully, he would make it. In addition, once the French gained control of some of the German trenches, there were still other Germans in trenches just across from them. Therefore, they would often spend days awake as it was no safe to sleep, since the enemy could easily attack. There were also bombs raining from the sky not only from the Germans but also from the French behind who were unaware that their comrades had taken part of the German line. A messenger would be sent down to tell the French artillery to stop bombing the trenches, and he would have to make the dangerous trip there and back alone. We then went to the town of Vieux Craonne that was completely destroyed during the war. We were able to see plaques with photos of what used to exist where there are now just craters and a few leftover stones. Our guide sang us a song about Craonne that was sung by soldiers who were against fighting in the war. They knew that death was very likely. This song was even forbidden in France until the 1970's. We saw the last part of Vieux Craonne from the bus and the the new Craonne that was rebuilt after the war. In fact, the government did not want to pay to rebuild the town as it was associated with this song of mutiny, so the town relied on money raised by some Swedish people who had come to fight or had lost people during the battles along the Chemin des Dames. Our last stop on the Chemin des Dames was a military cemetery for those killed along the battlefield. 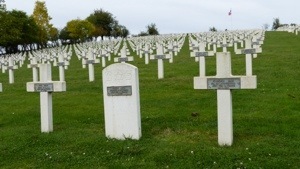 The cemetery was in Craonelle, and the soldiers were buried on the hill. It is very representative of their struggle to gain the hill and the German position during the battles of WWI. Our guide explained the different grave markers depending on the nationality and the religion of the soldier. We passed the obelisk monument to soldiers of the basque region on our way back to the Caverne du Dragon. Our guide left the students with two parting wishes: That they advance to 6th grade next year. And that they, their families, and their friends never know the atrocities of war that existed in this region during WWI. Tomorrow we will stay in Blérancourt to learn more about the Château de Blérancourt and its museum as well as the French American connection in this town started by Anne Morgan during WWI.